One of the greatest factors, if not the greatest, that was and is the driving force behind the speed of technological advancement in the world is the need for convenience. We all want to do the same things faster and without spending much energy, and also, very importantly, be safe while doing them. Vehicles were developed so we can go anywhere faster, easier, and safer, gas cooker were developed so we can cook faster, easier, and not have to deal with soot, phones were developed so we communicate faster, easier, and not have to go out during a blizzard to the post office to send a letter. Same thing goes for garage door openers. There are only a few people out there, if any at all, who’d like to get out of their cars into the rain or blizzard just to open their garage door and then climb back in, drive into the garage, and come out again to close it. But for most people the opener is a welcomed innovation. Using Your Smart Phone to Open the Door – Did We say Convenient? If you have one of the newest opener models by Genie or Liftmaster, you might know this function. No more losing the remote in your car or bag, no more excess weight on your car key-chain – all you need to do is use the app and open your door. But there’s more! Did you know that these smart openers allow you to monitor them from afar using Wi-Fi? You could be sitting at work and checking on the status of the door, and even open it from afar in case you need to let anyone else in. That’s a great question. The older the model, depending on its drive model (screw-drive being the loudest), the more likely it is for it to be loud. However, newer belt-drive models are so silent you could be sleeping soundly even when your bedroom is right above the garage. 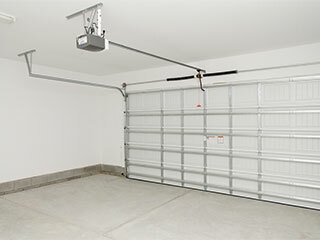 True, they are on the slightly pricier range, however if you have a detached garage, a new screw-drive opener could be a great choice just as well. All the convenience for a lower price!